There is not a better feeling than having a school of active panfish or perch under your hole on a feeding frenzy. Every angler on the ice has had dreams of pulling up double headers of jumbo perch or slab gills. However, schools of fish don't bite forever and can move on before giving you a chance to catch more than one. When catching a fish out of the school, you need to get the lure out of its mouth and back down to the rest of the fish as quick as you can. I will break the barbs off of a couple of my lures to help me with this. 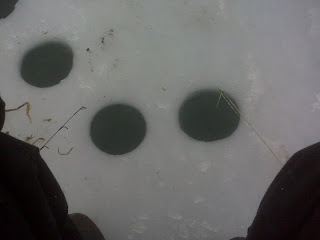 When I am in the middle of a fish frenzy, I can bring a fish out of the water and bounce it off of the ice to unhook the fish. I can then get the lure back down and hopefully keep the rest of the fish interested. I like to use two poles so I can always have a bait in the water when pulling up a fish. If I am lucky enough to catch a fish on both poles, I will only bring one fish to the ice at a time. Once I get one of the fish unhooked, I will put my jig back down and then bring up the other fish. This works well because fish are competitive. When other fish see the hooked fish, they will come in to see what is going on. I like to use plastic baits when the bite is on because they rarely fall off. When the fish are biting, you don't have to waste time re-baiting. My favorite plastic bait is a red plastic ball soaked in anise oil. Fish seem to love this offering and I have caught numerous jumbos on this bait. Some anglers like to throw live minnows down the hole while they are unhooking a fish or re-baiting. They hope that the fish in the area will hang around when they see the minnows. Throwing oatmeal down the hole can also keep fish in the area. The flakes will soak up water and slowly make their way down to the bottom of the lake and drive the fish crazy. Make sure to bring a spear when trying this tactic because the fish can become more interested in the flakes than your bait. A perch decoy in the hole can bring fish in and help them stay longer. Panfish and perch like to hang in groups. If the fish think the decoy is a real fish, they may be more likely to stick around it giving you more time to fill your bucket.